Cold activated label: drink cool! Want to know something really cool? 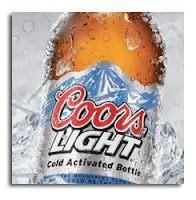 It’s the new cold activated label of the Coors light beer. How does it work? Do you see the beautiful mountains in back of the name? They turn from white to blue when your bottle reaches the ideal drinking temperature – 4° Celsius or 39° Fahrenheit. The best part is that it is also true the other way around. You got your beer out of the fridge at the perfect temperature and then left your drink somewhere while talking on the phone or pulling weeds in the garden? The mountains will turn white again to let you know you should put your drink back in the fridge! This would be a great tool for the wine world. Previous post: Beaujolais Nouveau: a brand killer?